Though the earthquake nearly decimated the city, the fires after it destroyed much of the city. 2,831 acres of the city was destroyed, 28,000 succumbed to the fire, and 250,000 were left homeless. In 1906 currency, the damages amounted to about $400,000,000 in damages(2009). Because many of the water mains were destroyed, the fire was extremely hard to extinguish. In order to assist in the relief efforts, the United States Army sent in troops from the Presidio to control riots/looting, attempt to create firebreaks, establish communication, set up relief camps, and provide medical care. To stop looting, Mayor Eugene Schmitz granted permission for police and troops to shoot on site anyone involved in certain crimes. With the troops in the city, many of the would be criminals were stopped by the presence of the Army. About 300 looters were shot, but General Funston said none by regular army troops. In order to stop some of the fires, Army engineers were brought in to blow up rows of buildings to stop the fire from spreading. It was widely held that the firebreaks fed the fires as much as they actually helped control the fire from spreading. Along with the apparent damage to the city, the earthquake severed all telephone/telegraph lines in the city as well. The U.S. Army Signal Corps from the Presidio was brought in and in 1 day, they were able to set up a direct line from Fort Mason in San Francisco to the Secretary of War in Washington. The Signal Corps set up 40 telegraph and 79 phone offices, which the city depended on until May 10th. To account for the homeless, the Presidio housed 20,000 citizens in tents and also built “relief shelters” which was rented out for $2 a month, or $50 to purchase. To help with the wounded, General Funston opened up the Army General Hospital in the Presidio and an Army field hospital. Along with providing medical relief, the Army enforced strict sanitation rules, which controlled the outbreak of typhoid or other infectious diseases. Brigadier General Frederick Funston was the most influential leader in the relief efforts for the Army. 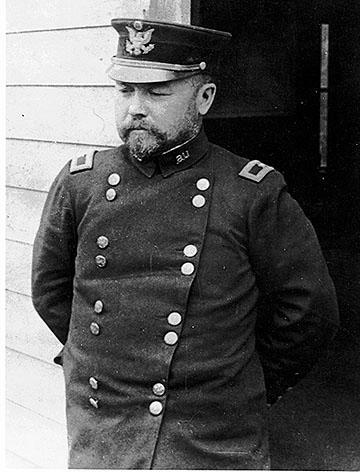 Funston first fought with the Cubans against the Spanish and later joined the U.S. Army as a Colonel in 1898. He was awarded the Medal of Honor in the Philippine-American War for his heroism in taking an enemy position. During the 1906 earthquake, Funston was in control of the Presidio and oversaw much of the relief effort set up for the city by the Army. As soon as the earthquake hit, Funston glanced at the city and instantly recognized that there would be a need for U.S. Army soldiers to assist the city. Funston was behind setting up the firebreaks that helped stopped much of the fire within the city, opened up the Presidio for refugees and medical aid, and gave troops to the city to combat crime. Many have praised and criticized Funston for his actions during the relief efforts, but without many of his decisions, the city of San Francisco might not have been the same as it is today.